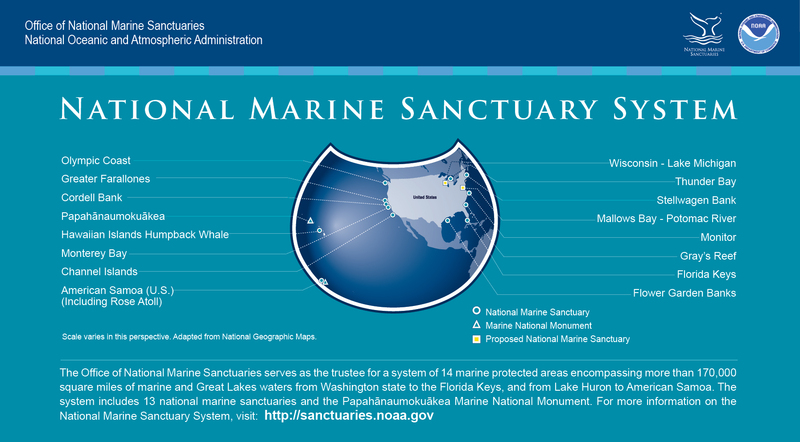 Our national marine sanctuaries embrace part of our collective riches as a nation. Within their protected waters, giant humpback whales breed and calve their young, temperate reefs flourish, and shipwrecks tell stories of our maritime history. Sanctuary habitats include beautiful rocky reefs, lush kelp forests, whale migrations corridors, spectacular deep-sea canyons, and underwater archaeological sites. Our nation’s sanctuaries can provide a safe habitat for species close to extinction or protect historically significant shipwrecks. Ranging in size from less than one square mile to 137,792 square miles, each sanctuary site is a unique place needing special protections. Natural classrooms, cherished recreational spots, and valuable commercial industriesmarine sanctuaries represent many things to many people. The mission of NOAA's Office of National Marine Sanctuaries is to serve as the trustee for the nation's system of marine protected areas, to conserve, protect, and enhance their biodiversity, ecological integrity and cultural legacy.